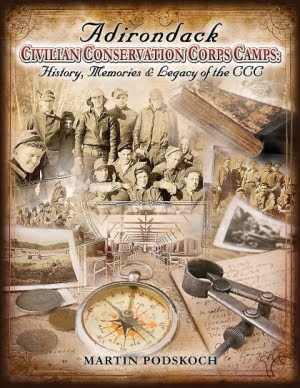 On Saturday, June 16, 2012, the Schenectady County Historical Society will host a reunion of Civilian Conservation Corps alumni, family, & friends from 2:00-4:00 p.m. at 32 Washington Avenue, Schenectady. Marty Podskoch, author of Adirondack Civilian Conservation Corps Camps: Their History, Memories and Legacy, will give a short presentation and will invite participants to share their memories of the camps. The Civilian Conservation Corps (CCC) began on March 31, 1933 under President Roosevelt’s “New Deal” to relieve the poverty and unemployment of the Depression. Camps were set up in many New York towns, state parks, and forests. Workers built trails, roads, campsites and dams, stocked fish, built and maintained fire tower observer’s cabins and telephone lines, fought fires, and planted millions of trees. The CCC disbanded in 1942 due to the need for men in World War II. Marty Podskoch is a retired teacher and is the author of six books: Fire Towers of the Catskills: Their History and Lore, two volumes of Adirondack fire tower books: Adirondack Fire Towers: Their History and Lore, the Southern Districts, and Northern Districts and two other books, Adirondack Stories: Historical Sketches and Adirondack Stories II: Historical Sketches, from his weekly illustrated newspaper column. After 5 years of research and interviews, Marty Podskoch has completed his new book, Adirondack Civilian Conservation Corps Camps: Their History, Memories and Legacy. The 344-page book contains over 500 pictures and illustrations, 26 maps, and 25 charts. The author will have all of his books available after the presentation for sale and signing. For more information on the reunion or to RSVP, contact Melissa Tacke, Librarian/Archivist at the Schenectady County Historical Society, by phone at 518-374-0263, option “3”, or by email at librarian@schist.org. The Schenectady County Historical Society is wheelchair accessible, with off-street parking behind the building and overflow parking next door at the YWCA. 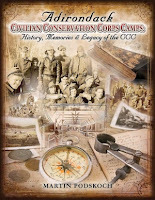 The Adirondack Museum will offer its fifth event in the 2012 Cabin Fever Sunday series, the &#8220Adirondack Civilian Conservation Corps: History, Memories and Legacy of the CCC,&#8221 in North Creek, (Warren County) on Sunday, March 11, 2012. The Civilian Conservation Corps (CCC) was a public works program that operated from 1933 to 1942 as part of Franklin D. Roosevelt’s New Deal. In the Adirondacks, enrollees built trails, roads, campsites and dams, they stocked fish, built and maintained fire towers, observers’ cabins and telephone lines, fought fires, and planted millions of trees. Learn about camp life and Adirondack projects with author Marty Podskock. Marty Podskoch, a retired reading teacher, is the author of three other books: Fire Towers of the Catskills: Their History and Lore (2000)- Adirondack Fire Towers: Their History and Lore, the Southern Districts (2003)- Adirondack Fire Towers: Their History and Lore, the Northern Districts (2005). While gathering stories of the forest rangers and fire tower observers, he became fascinated with other aspects of the Adirondacks such as the logging and mining industries, the individualistic men who guided sportsmen, the hotels they stayed in, the animals, railroads, etc. Marty and his wife, Lynn, live in Colchester, CT where they are close to their family and two granddaughters, Kira and Lydia. He enjoys hiking in the nearby Salmon River Forest and is doing research on the CCC camps of the Adirondacks and Connecticut. For more information, visit http://www.cccstories.com/index.html. This program will be held at the Tannery Pond Community Center, North Creek, N.Y., and will begin at 1:30 p.m. Free to members and children- $5 for non-members. For additional information, please call (518) 352-7311, ext. 128 or visit www.adirondackmuseum.org. Marty Podskoch’s newest book Adirondack Civilian Conservation Corps Camps: Its History, Memories and Legacy of the CCC, is now available. The 352-page large-format book contains 185 interviews, over 50 charts and maps, and over 500 pictures and illustrations. Podskoch is also the author of five other books: Fire Towers of the Catskills: Their History and Lore, two volumes of Adirondack Fire Towers: Their History and Lore covering the Southern and Northern districts, and two other books, Adirondack Stories: Historical Sketches and Adirondack Stories II: 101 More Historical Sketches from his weekly illustrated newspaper column. You can by the book in local stores for $20.00. It can also be purchased by contacting the author at (860-267-2442) or at 43 O’Neill Lane, East Hampton, CT 06424. Include $3 for shipping. Note: Books noticed on this site have been provided by the publishers.